Good vocal health practices are essential to performers of all styles. Here you can gather general information about how to maintain your instrument, links to useful Vocal Power seminars, as well as referrals for other trusted vocal health professionals. Caffeine and alcohol pull water out of your system and deplete the vocal folds of needed hydration. Caffeinated drinks include coffee, tea, and soft drinks. Small amounts of these beverages are acceptable but must be counterbalanced by drinking more water. Another factor affecting lubrication is a dry air environment. This occurs with gas furnaces, air conditioners, and arid climates. Using a humidifier at night can compensate for dryness, but it is important to keep it clean so that bacteria and mold are not spread into the air. The air in airplanes is extremely dry. It is recommended that you avoid alcoholic and caffeinated beverages and drink at least 8 ounces of water per hour while flying. World renowned otolaryngologist Dr. Van Lawrence often recommended a favorite gargle recipe: 1/2 tsp. of salt, 1/2 tsp. of baking soda, 1/2 tsp. of clear corn syrup, and 6 oz. of warmed, distilled water. Gargle quietly and gently for two long, boring minutes. Do not rinse and use as often as necessary to help your dry, irritated throat. In addition, Entertainer's Secret® (800 308-7452) throat spray is an effective way to help moisturize the vocal folds (follow the directions on the label). Throat clearing and harsh coughing are traumatic to vocal cords and should be avoided as much as possible. One of the most frequent causes for throat clearing and coughing is thick mucus (due to dry vocal folds) or too much mucus (as with a cold) on or below the vocal folds. The safest and most efficient way to clear mucus is by using a gentle, breathy productive cough where there is high airflow with little sound. This can be achieved by using the following strategy: take in as deep a breath as possible, momentarily hold your breath, and produce a sharp, silent AAAH sound while you expel the air. Throat clearing often becomes a habit or a nervous tick and sometimes goes unnoticed. It is important that this habit be broken. Antihistamines: These drugs are sometimes prescribed to treat allergies and are present in many over-the-counter cold medications. Antihistamines should rarely be used because they tend to cause dryness. Prescription nasal steroid sprays such as Nasacort® (Phone-Poulenc Rorer), Nasonex® (Schering), Flonase® (Allen & Hansburys), etc. will often relieve the symptoms of nasal allergy without the drying side effects of antihistamines. They are only available by prescription. Analgesics: Aspirin products and non-steroidal anti-inflammatory drugs (ibuprofen) should be used with caution as they cause platelet dysfunction. This may predispose to bleeding. Tylenol® (McNeil Consumer Products) is the best substitute for pain relief. Mucolytic Agents: The most common expectorant is a preparation of long-acting guaifenesin to help liquefy viscous mucus and increase the output of thin respiratory tract secretions. Drugs, such as Mucinex®, may be helpful for singers who complain of thick secretions, frequent throat clearing, or postnasal drip. Awareness of postnasal drip is often caused by secretions that are too thick rather than too plentiful. Mucolytic agents need to be used with a lot of water through the day to be effective. Local Anesthetics: Avoid the use of over-the-counter local anesthetic preparations, such as Chloraseptic, for the throat. Singing under their influence is like trying to play the piano with gloves on. Progesterone: Question the use of progesterone-dominant birth control pills. They may cause virilization of the female larynx and a loss in the upper vocal range. There may be no other alternative for your individual situation, however, so consult your gynecologist. When we eat something, the food reaches the stomach by traveling down a muscular tube called the esophagus. Once food reaches the stomach, the stomach adds acid and pepsin (a digestive enzyme) so that the food can be digested. The esophagus has two sphincters (bands of muscle fibers that close off the tube) to help keep the contents of the stomach where they belong. One sphincter is at the top of the esophagus (at the junction with the upper throat) and one is at the bottom of the esophagus (at the junction with the stomach). The term REFLUX means "a backwards or return flow" and refers to the backward flow of stomach contents up through the sphincters and into the esophagus or throat. What are GERD and LPRD? Some people have an abnormal amount of reflux of stomach acid and enzymes that that go up through the lower sphincter and into the esophagus. This is referred to as GERD or Gastroesophageal Reflux Disease. If the reflux makes it all the way up through the upper sphincter and into the back of the throat, it is called LPRD or Laryngopharyngeal Reflux Disease. The structures in the throat (pharynx, larynx, vocal folds and the lungs) are extremely sensitive to stomach acid and enzymes, so smaller amounts of reflux into these areas can result in much more damage. Why Don't I have Heartburn or Stomach Problems? This is a question that is often asked by patients with LPRD. The fact is that very few patients with LPRD experience significant heartburn. Heartburn occurs when the tissue in the esophagus become irritated. Most of the reflux events that can damage the throat happen without the patient ever knowing that they are occurring. Hoarseness, chronic (ongoing) cough, frequent throat clearing, pain or sensation in throat, feeling of a lump in throat, problems while swallowing, bad/bitter taste in mouth (especially in the morning), asthma-like symptoms, referred ear pain, post-nasal drip, singing difficulties (especially with high notes). The most effective treatment for LPRD are diet modification and drugs called proton pump inhibitors. Included in this group are Prilosec®, Prevacid®, Protonix®, Aciphex®, and Nexium®. Ask your physician which may be appropriate for you. Avoid smoking cigarettes. They are bad for the heart, lungs, and vocal tract. Also, avoid other irritant inhalant substances and mind-altering drugs. Tobacco and marijuana are irritants to the vocal tract. Smoking is one of the worst things you can do for your speaking and singing voice. Try your best to maintain good general health. Get adequate rest to minimize fatigue. If you do become ill, avoid "talking over your laryngitis" - see your physician and rest your voice. Avoid the phone, use email and texting instead. Eat a balanced diet, including vegetables, fruit and whole grains. Maintain body hydration; drink two quarts of water daily. Avoid dry, artificial interior climates and breathing smoggy, polluted air. Limit the use of your voice in high-ceilinged restaurants, noisy parties, cars and planes. Stop yelling and avoid calling from room to room. Avoid hard vocal attacks on initial vowel words. Use the pitch level in the same range where you say, "Umm-hmm?" Speak in phrases rather than in paragraphs, and breathe slightly before each phrase. Reduce demands on your voice. Don't do all the talking! Vocal athletes must treat their musculoskeletal system as do other types of athletes; therefore, vocal warm-ups should always be used prior to singing. Vocal cool-downs are also essential to keep the singing voice healthy. If you need to get someone's attention, use non-vocal sounds such as clapping, bells or whistling. Move closer to those with whom you are speaking. Face the person(s) with whom you are speaking. Use amplification, as needed, if possible. Reduce your speaking time in noisy environments, such as in automobiles and airplanes. Use good abdominal/diaphragmatic breathing and support. Learn to use your voice with as little unnecessary effort and tension as possible. Take frequent breaths when speaking long sentences. Maintain a smooth legato speech pattern with clear articulation. Allow the neck, jaw, and face to be relaxed. “Place” or “focus” the voice appropriately. Speak at a normal rate of speed. 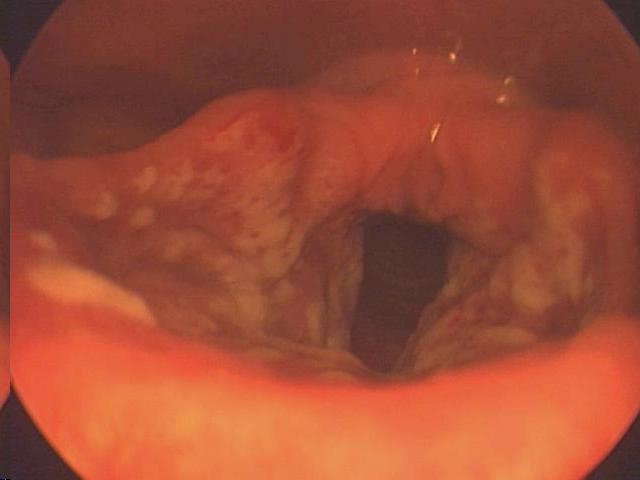 Below are a few images and videos that illustrate what healthy and unhealthy vocal cords look like, as well as a vocal cord polyp removal surgery.